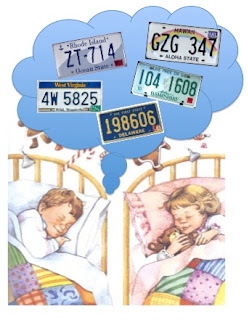 The first day of License Plate Game 2011 is history and after dreaming all night of all those plates out there waiting to be found, we're waking up to another day. The first day found the contestants making many snarky comments about each other. Hopefully, today we will be a little more civil. After all, this is a family fun game and winning isn't EVERYTHING, and everyone can't be the Reigning Queen. I don't have first day totals from everyone, but Team Gallina seems to have the lead with "coughseventeencough" and Team Cange has thirteen! Today is another day. As Bob said, "Game on!"